At BEMCO, quality control starts from vendors & continues through the various stages of manufacturing, right up to the final testing and painting of products. Quality policy is built into the system & our systems are as strong as the people working in the background. 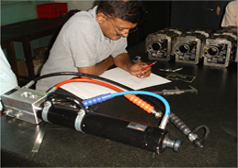 Stringent inspection of materials & components at every stage of production activity is way of life at BEMCO. Extensive & specialized quality control facilities backed by skilled and experienced personnel ensure that only the best products reach our customers. We strive for conformance of Products & Services to the global standards and deliveries are made as per scheduled development plan.